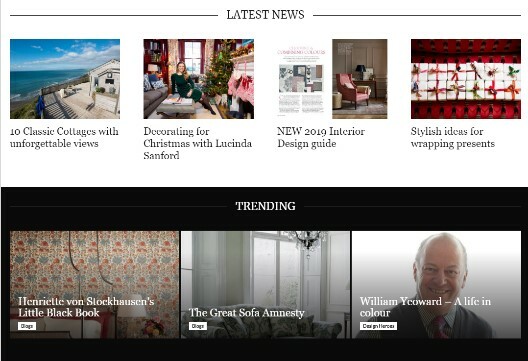 Classic Cottages | Read our latest features in the press. 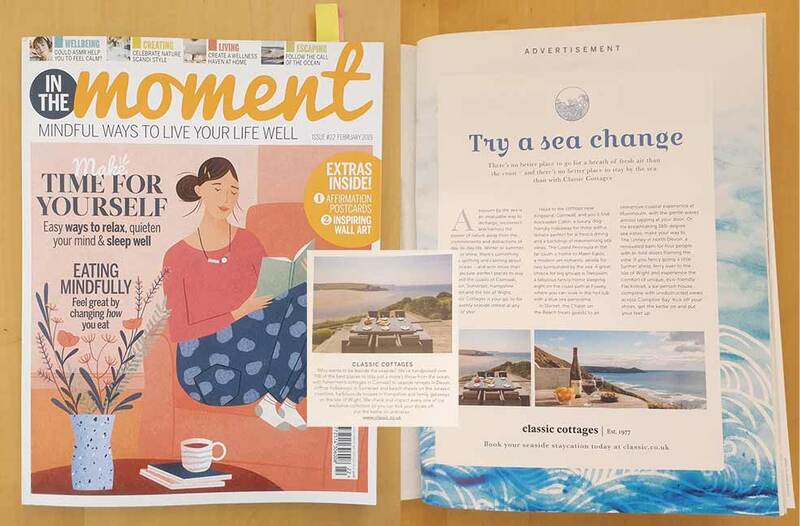 A few properties featured in a page about holidays by the sea plus Sunnynook was picked for their feature of four coastal retreats. Dieppy Farm Cottage was chosen as #10 for this selection of cabin and cottage boltholes for two. 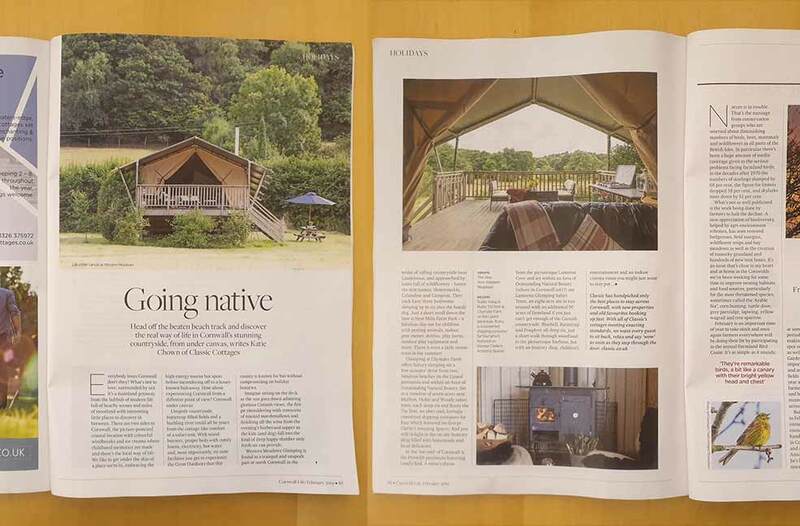 Lodges and cosy cabins feature in our Somerset glamping editorial. 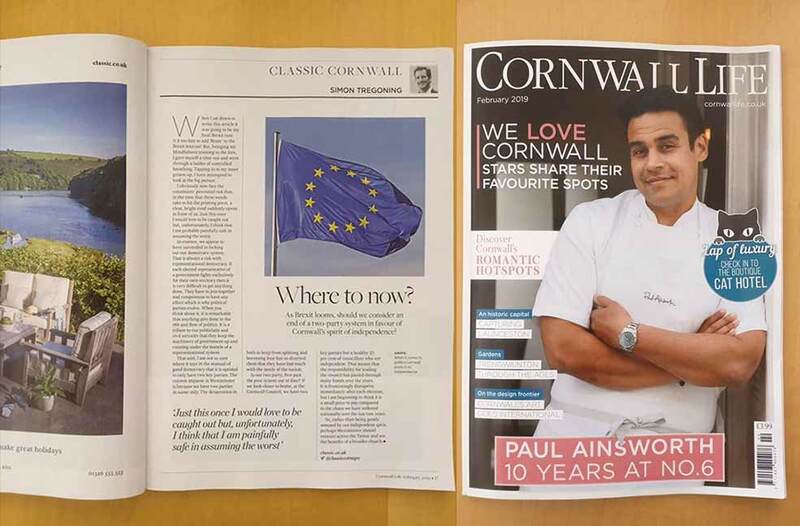 Company owner Simon talks Brexit alongside our full page feature advert. The delights of glamping in Dorset, featuring The Chalet on the Beach. Showcasing Devon glamping and why everyone should go - if you've been, you'll know. 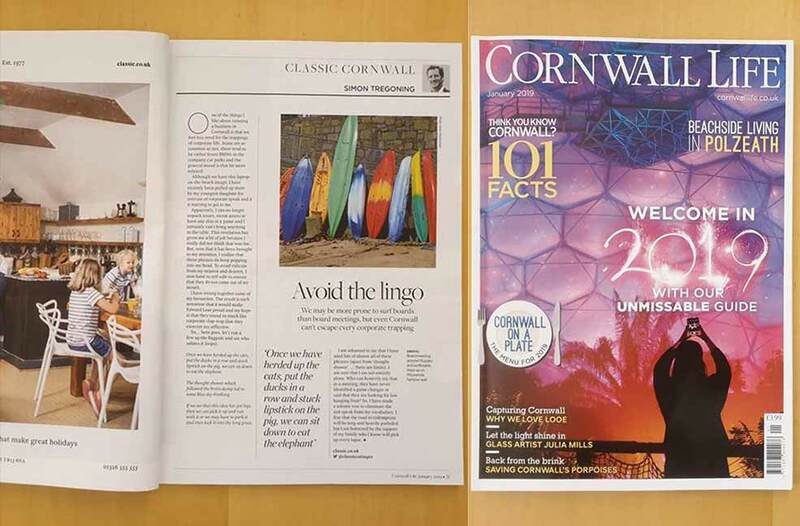 A double page editorial all about our glamping offerings in Cornwall. 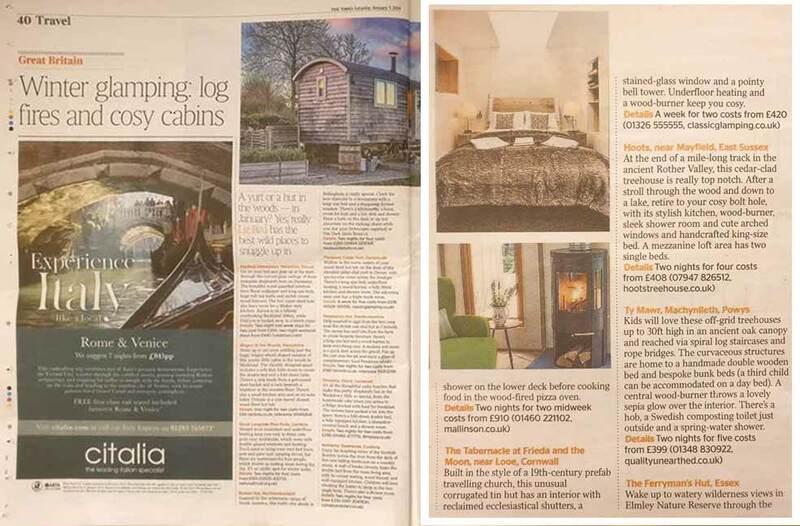 The Tabernacle at Frieda and the Moon, the most enviable of glamping interiors, was chosen to appear in The Times Winter Glamping feature. 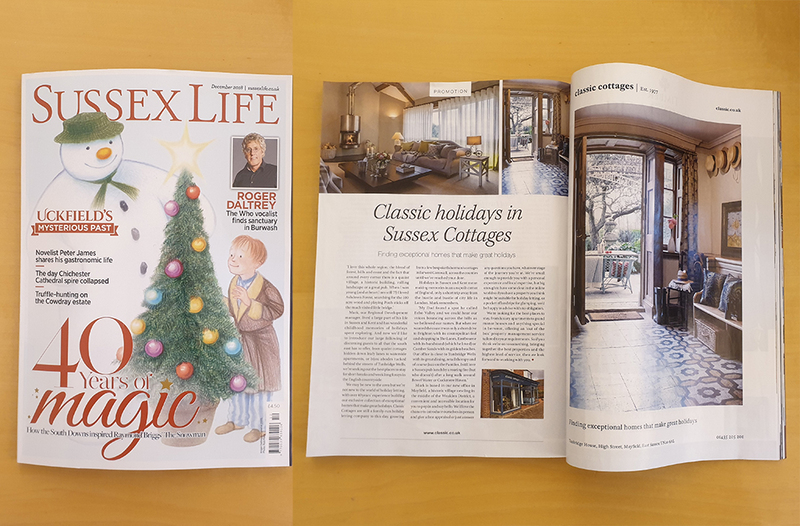 Company owner Simon talks business, next to our beautiful full page ad, in the January edition 2019. 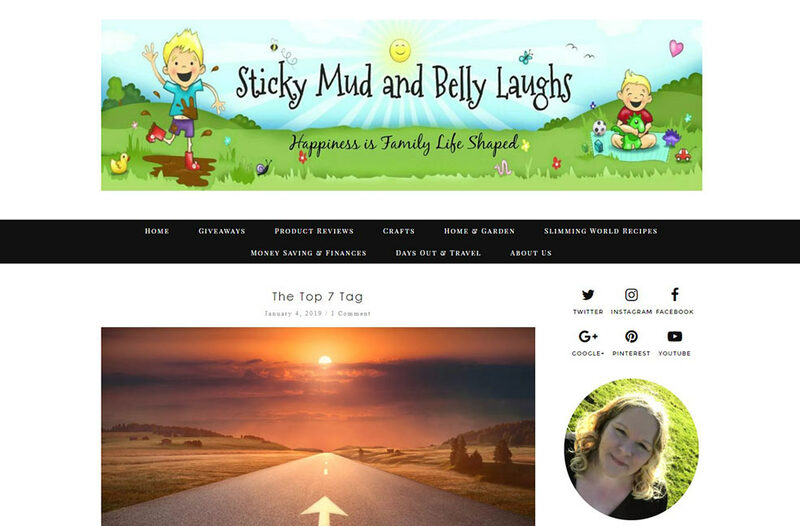 Sticky Mud & Belly Laughs rated their stay with us one of their top 7 moments of last year! 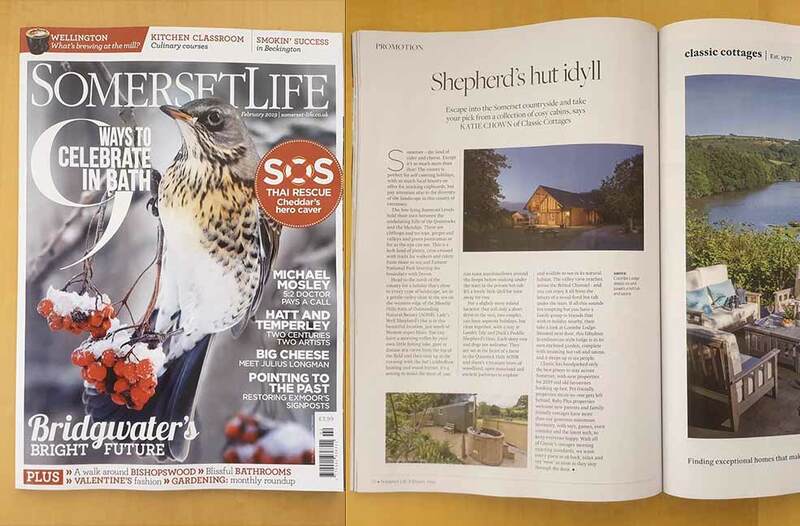 Greenhills Cottage near Bruton, Somerset was chosen to feature second in the list of perfect places to stay this New Year. 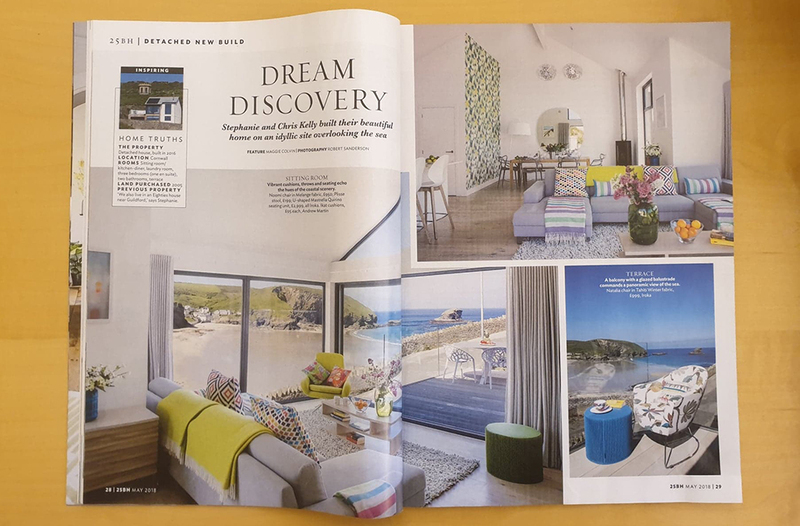 10 of our properties with amazing views feature in this advertorial with English Home Magazine. Featuring alongside, Peru, Italy and Sri Lanka, 23 Coastguard Cottage (3534) in Bembridge on the Isle of Wight was chosen as the perfect last minute New Year break. Introducing ourselves to the people of Sussex, as we open a new office in Mayfield. 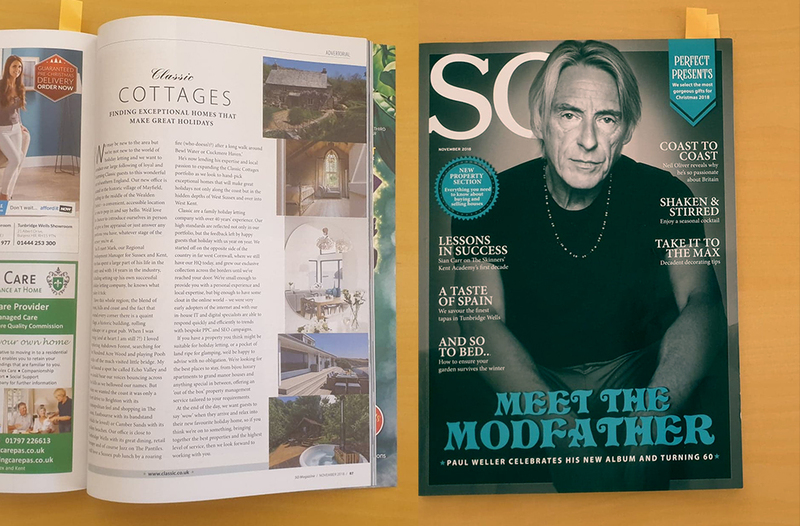 Introducing ourselves and getting properties in front of a new audience with a glossy mag in Sussex and Kent. A full page ad for a new Sussex audience, featuring the gorgeous hallway of The Old Manor House (2556). 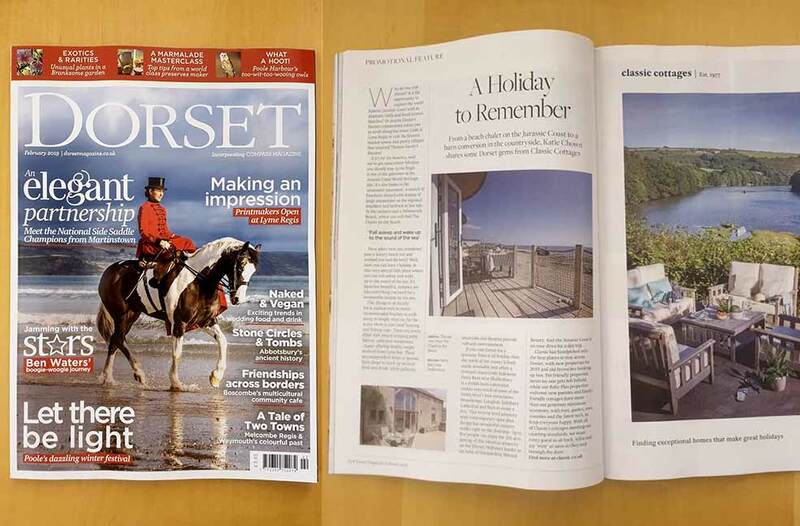 inews.co.uk featured Sceat Cottage in Devon among holidays such as Loire Valley and the Amalfi Coast to help beat the post-summer blues this October. 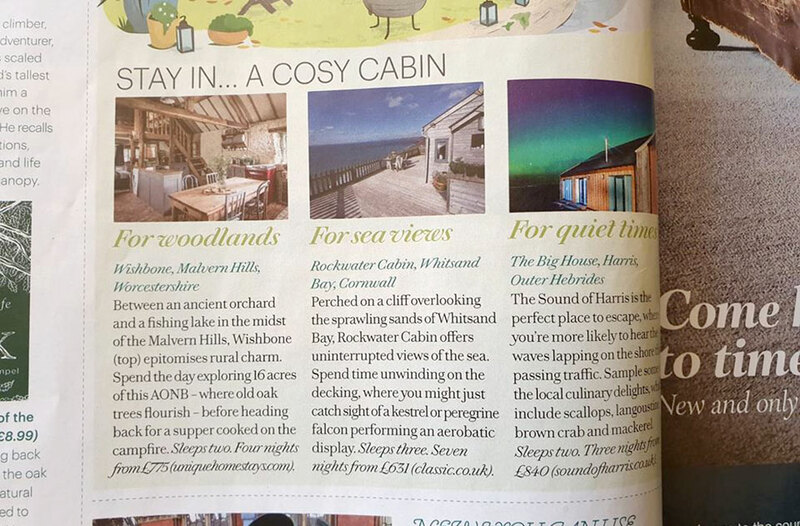 Rockwater Cabin (3229) was chosen as one of three cosy cabins to stay in this Autumn by Country Living Magazine. What a location! 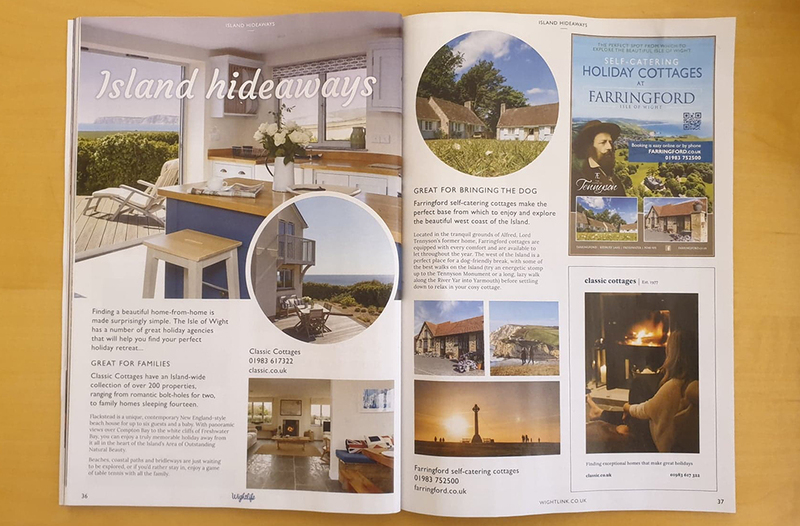 A page feature on Island hideaways with Flackstead (3913) and a little quarter page ad in this popular guide from Wightlink ferries. 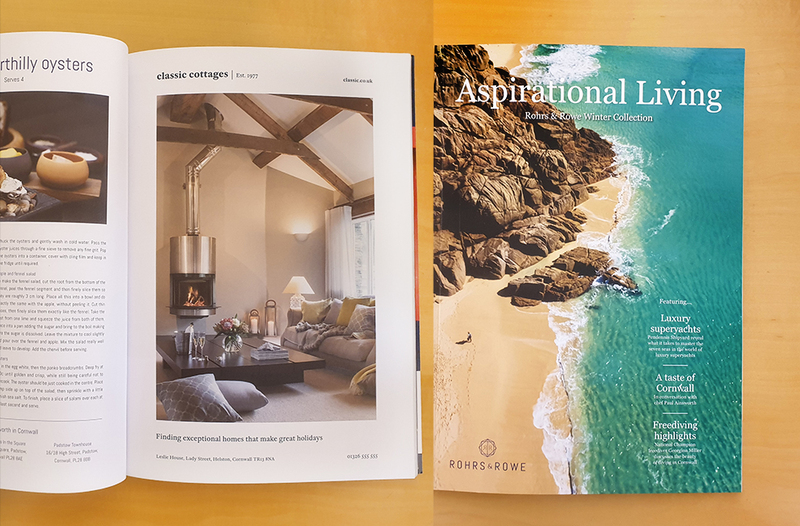 Mill Barn (3352) featuring in our latest full page advert for Rohrs & Rowe's Aspirational Living magazine. 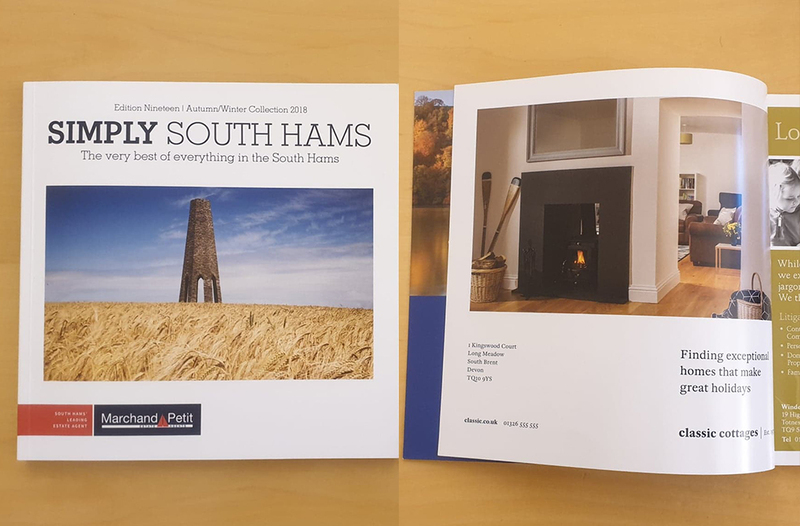 'The very best of everything in the South Hams', so of course we have a full page in there. 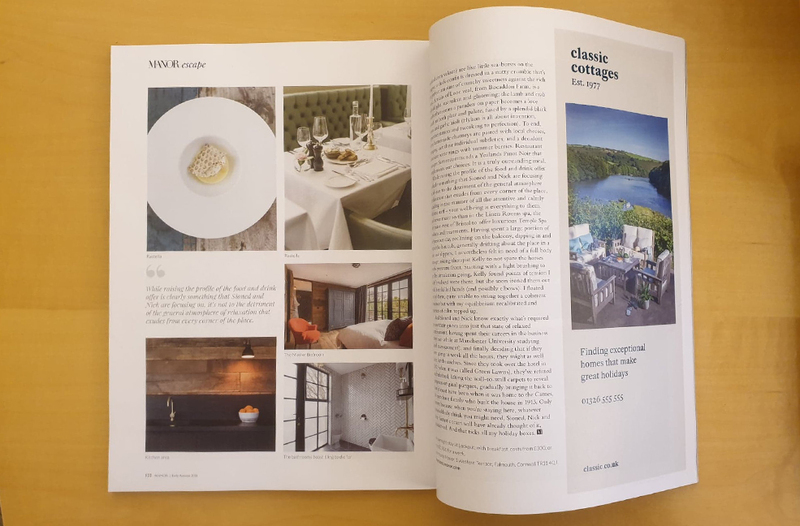 Merchants Manor featured on a couple of spreads so we capitalised by placing a neighbouring ad, with Lookout and Landlubber in the portfolio. 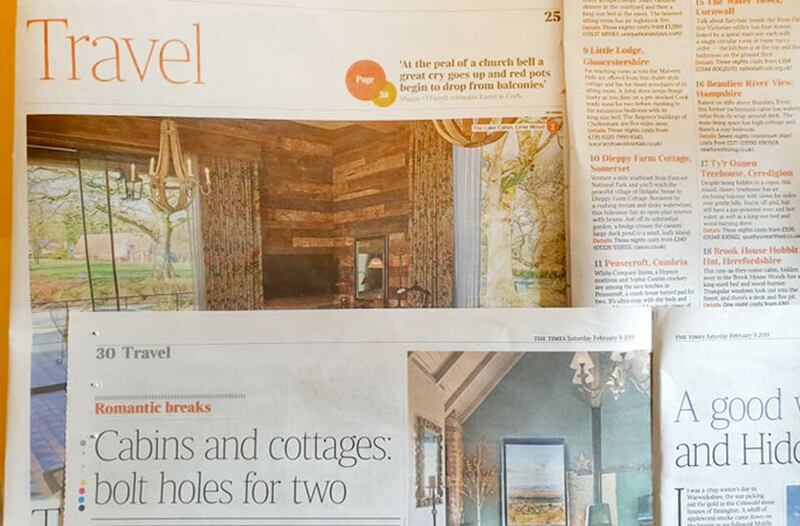 Sunnynook was chosen as one to book now before you miss out and featured on the Sunday Times Travel spread. 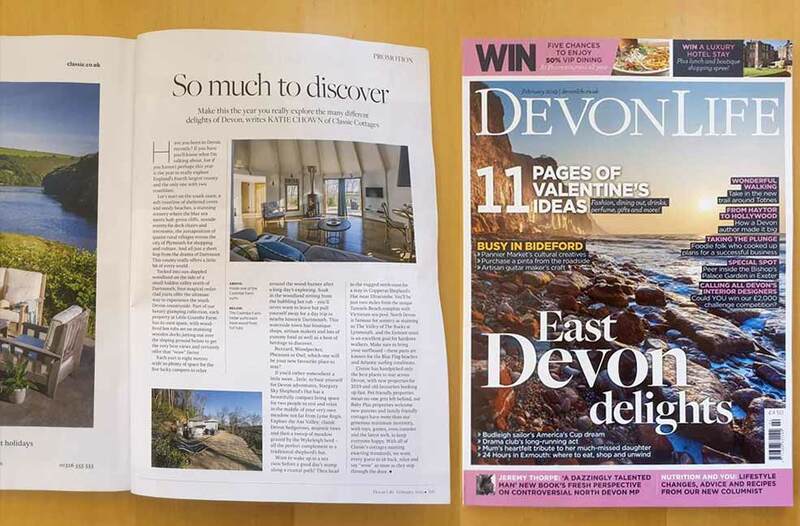 Sunnynook in Devon was Number 1 of 10 cottages featured in times.co.uk best staycatyions to book now for summer 2019. 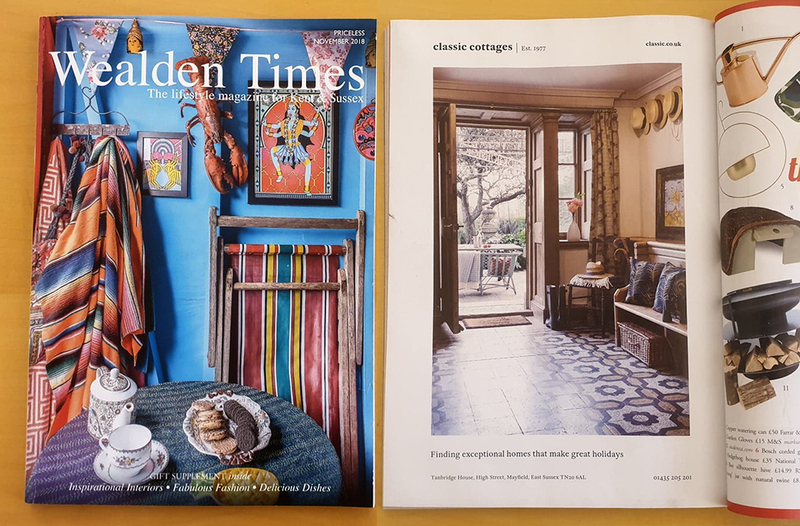 Castle house featured as 'grand but cosy' in the Great Escapes section of this popular magazine. 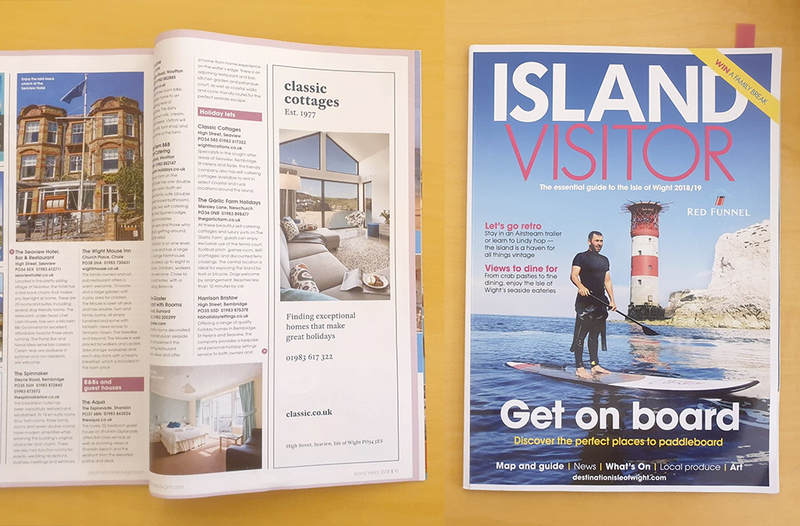 A beautiful four double page spreads tell the story of how Flackstead on the Isle of Wight came to be the outstanding holiday home it is today. Nanteague Farm in Cornwall was chosen for a feature on places to stay in the UK because of the heated outdoor swimming pool. They were looking for luxury and found it in the Quantock Hills at Coombe Lodge. 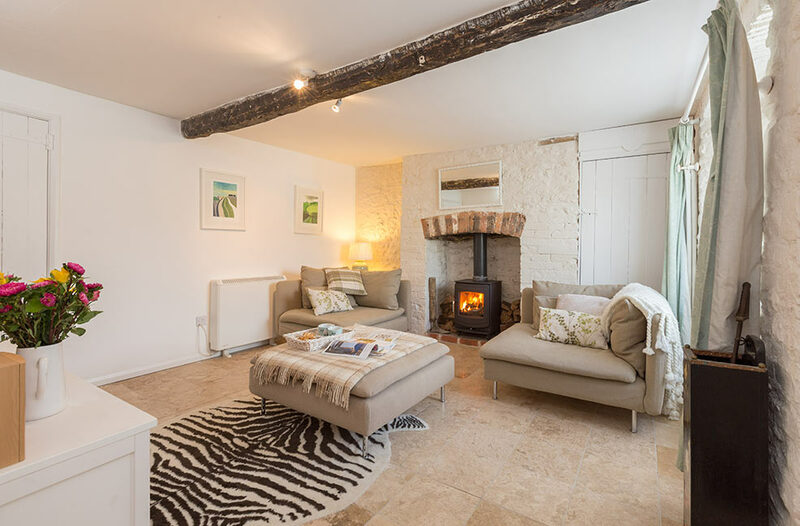 The best of the best in the Blackdown Hills, The Cow Shed was the perfect setting for a Somerset holiday. Explore the north Cornish coast from Mapled Cottage in St Agnes, chosen by The Guardian as one of 20 top UK cottages for beach holidays. 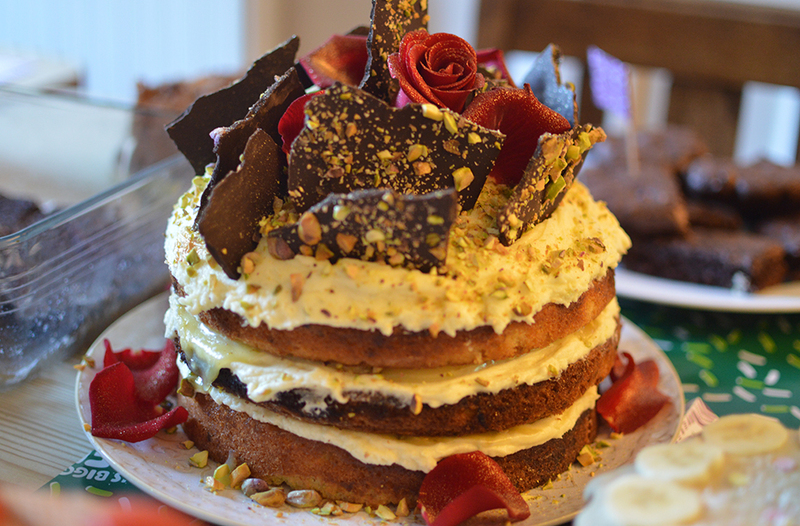 Food blogger and writer, Kate, enjoyed a self catering stay in Falmouth with her young family. An ideal countryside retreat for a sightseeing or a relaxing holiday near St Ives in Cornwall. A stay on the island based on the Barton Manor Estate near East Cowes. 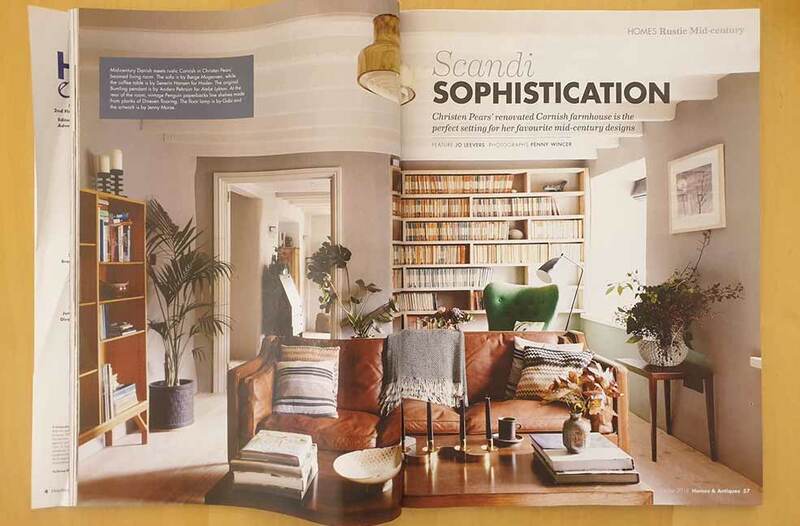 Two double page spreads of a journalist photoshoot and owner interview at Rock (3325). Take a trip to your childhood with a stay in the cottage where Christopher Robin lived, near Dartmouth. The hot tub and games-room were rainy day saviours for this young family on holiday in Devon. A magical place for a holiday with big ones and little ones, on the edge of Bodmin Moor. It's not often you get to stay in a real castle, but Sally did in Taunton, Somerset. Melissa was wowed when she walked through the door of one of our Morwenstow Apartments overlooking Porthminster beach in St Ives. Mark Rowe chose to stay at Raleigh Cottage in Seaview to explore the island for National Geographic. Both The Linney and Barnell Cottage feature as luxury lodgings when out walking the South West Coast Path. 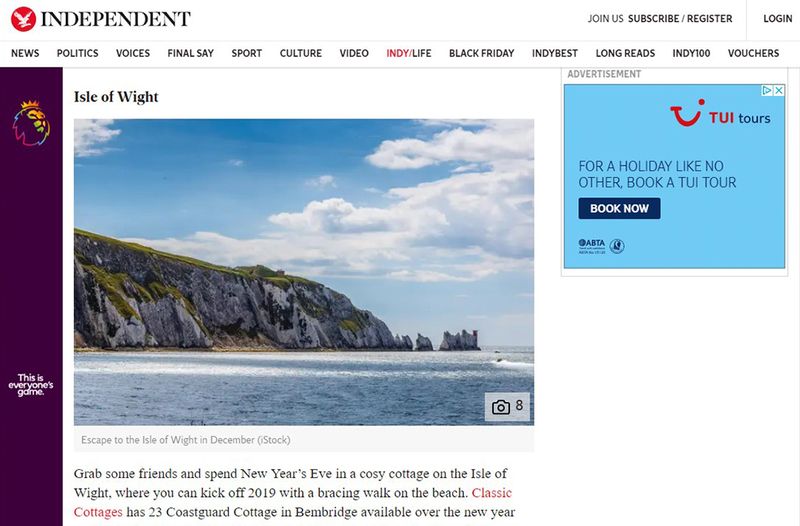 Making sure we feature in front of people wanting to visit the Isle of Wight with a half page ad and cottage listing.